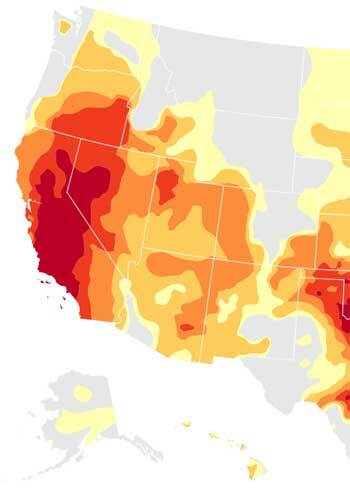 Scientists are calling the current wave of drought, which began to spread across California, much of the Southwest, Texas, and Oklahoma in 2011, the worst drought since the 1950s. While the drought has ebbed in Texas and parts of the Southwest, California and other states continue to bear the brunt of this epic change in rainfall. As of the end of March 2015, approximately 37 percent of the contiguous United States was still experiencing at least moderate drought conditions. The New York Times‘ analysis of the Palmer index, which tracks rates of drought going back 100 years, found that the 10-year average for drought has been increasing for most of the last 20 years. In California in 2014 alone, the cost of the drought was $2.2 billion, with 17,000 agricultural jobs lost. In the face of the crisis, California Governor Jerry Brown has instituted the first mandatory water restrictions in his state’s history, requiring all 400 local water boards to reduce water use by 25 percent — or face stiff fines. He has said watering lawns will soon be a thing of the past, but it’s unclear if everyone will heed the call. The Los Angeles Times points out that the wealthiest residents consistently use higher amounts of water, perhaps because they can afford to, ignoring the calls for conservation. More responsible homeowners have already gotten rid of their lawns in favor of native plants and other techniques that reduce water use for landscapes, while others are investigating “smart lawn sprinklers” that have built-in sensors. A 2014 study from the University of California at Davis Center for Watershed Studies found that farmers have already been hit hard: a “6.6 million-acre-foot reduction in surface water.” According to The San Francisco Chronicle, one acre-foot is equivalent to about a football field covered in water. “That has meant a 25 percent reduction in the normal amount of surface water available to agriculture. And it was mostly replaced by increased groundwater pumping.” Last year, Gov. Brown also pushed through a new groundwater management law, putting in stricter limits on groundwater use that will take years to come into effect. In the 20th century, drought hit the U.S. in waves. From 1997 to 1998, a major drought, which affected 36 percent of the country, created $39 billion in damages. The northern Great Plains were worst hit, but the west coast and Pacific Northwest were also impacted. With the loss of rain, terrestrial systems dry out, raising the number of forest fires. According to Live Science, in 1988, 793,880 acres of Yellowstone National Park burned, prompting the first complete closure of the park in history. In the 1950s, drought conditions, at their peak, covered more than half of the country. The National Climate Data Center explains that this drought devastated the Great Plains region; in some areas, crop yields dropped as much as 50 percent. And during the Dust Bowl in the 1930s, the U.S. was hit by three waves of drought that at one point impacted more than 70 percent of the country, with mass migrations and a great loss in agricultural productivity for years after. As The Washington Post meteorology team explains, just because the western and southern drought has officially ended in some places, it doesn’t meant it’s actually over. Communities will need double or triple the amount of water they would receive under normal conditions to undo the deficit, recharge groundwater, and restore incredibly low reservoir levels. It will take more than a few storms. Stringent water conservation is here to stay. But in the meantime, California, the Southwest, Texas, and other states can make better use of their water resources — by applying water-efficient drip irrigation systems in the agricultural sector, like Israeli farms have been doing for years; replacing lawns with drought-tolerant native plants; getting rid of leaks, wasteful showerheads, and full-flush toilets in homes and businesses; and recycling and reusing all greywater and even blackwater. Good article. I really think we need to look at our rainfall through a different set of glasses. The rainfall average or what we might call normal is just much lower than what we want to use all the time. Since climate and rainfall go in waves of long periods of time, we need to look at our uses at much lower rate and consider a higher rainfall year as a more than “normal” event and count it as a blessing. We just need to recalibrate at a lower useage from here on. 1. Much of California agriculture is more for economic gain than for absolute nutritional needs. Almonds are a water-intensive and easily-harvested crop (a tree-shaking machine does it). Other high-water-use crops are grown for export, and thus not essential for human survival here. The Salinas Valley of Steinbeck fame IS important for human nutrition and should not be water-curtailed. Vineyards? a totally luxury industry. 2. State water policy should prioritize crop demand for their human sustenance importance, not their economic importance. Big Ag has a lot of political influence in this state, and that influence is aimed at preserving profits, not nutritional survival for our residents. 3. I say this as a scion of a ranch owner in Solano County and a participant in the nursery industry. Nursery stock is very profitable, but is not nutritionally imperative, and is an example of water use which should not be of highest priority. I don’t think Californians know how dire our water situation is. When those new 1/3 mile deep wells dry up, then what?